Three-ring binders are one of my favorite ways to declutter papers and keep track of important information. Simple three-ring binders are versatile, convenient and inexpensive. They come in a variety of colors, styles and widths. They line up neatly on a shelf, but they can also be stashed in a deep drawer or basket if you prefer to keep them out of sight. It’s easy to add papers or to remove them when they are no longer needed. 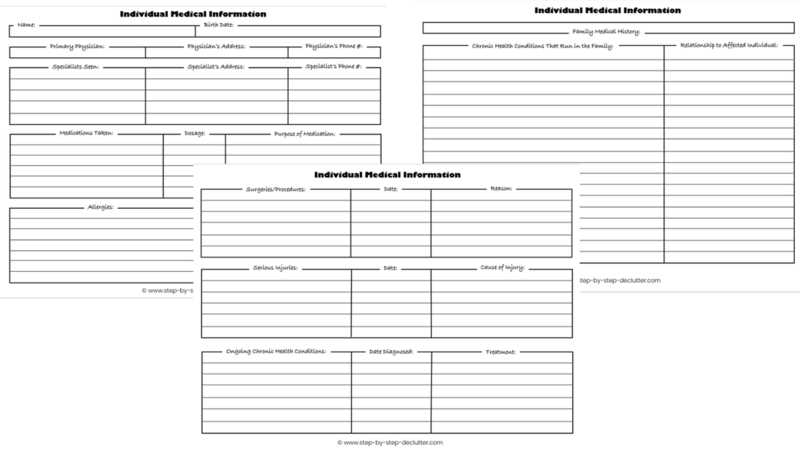 Store papers in plastic page protectors for extra protection and greater ease in adding or removing information. My favorite binders are white 1.5 inch binders with a clear non-glare overlay. Larger binders are too cumbersome. Smaller binders don't hold enough information. The clear plastic overlay allows you to customize your binder however you like and change it out with ease if you so choose. ​This page contains affiliate links. Include tabs for school, work, sports, activities (music lessons, community theater, book club, church groups, Scouts, etc. ), volunteer work, shopping, eating out, entertainment, and anything else you might be involved in. Within each section, include calendars and schedules as appropriate. Also include rosters, price lists, menus, business cards, brochures, and whatever else you want to keep track of. Creating an Activities binder is a great way to declutter papers from your refrigerator and other surfaces where they tend to collect. A Household binder is the place to declutter papers relating to your home. Use it to organize warranties and instruction manuals for all your major appliances. Be sure to include the date of purchase and, if possible, the receipt in case you need to make use of the warranty. Simply staple the receipt to the front cover of the instruction manual. In addition to appliances, include information regarding roofing, carpeting/flooring, windows and doors, HVAC, water heater, gas fireplace, and any other items inherent to your home. Do not include all your warranties and instruction manuals in your household binder, only those belonging to items that are inherent to your home and likely to remain with it should you move (such as the refrigerator, gas fireplace, garage door opener, etc.). Information on consumer electronics, small appliances, sporting goods and so forth are best stored elsewhere in the interest of space. Also include a section on décor in your Household binder. Keep a paint sample for each of the paint colors used in your home. Write on the back of the sample the room where the color is used and the date the walls were painted. 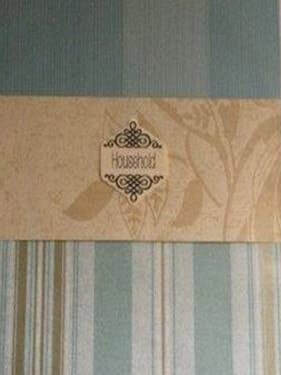 Also include fabric scraps, tile samples, wall paper samples and other finishes as well. If samples are too bulky to include in your binder, take a photo and include it in your binder along with a notation regarding the actual location of the sample. This information will come in handy in the event you need to make repairs or do some touch ups. Create a Family Facts binder to house all the important information regarding your family. The information you keep here will be of value not only to you and your family, but also to any others who care for your children in your absence or who might need to assist you in an emergency. Include the following information in your Family Facts binder, insofar as it applies to you, as well as any other information you feel is relevant. ​Keep a list of policy numbers, basic information regarding coverage, and contact information for your insurance company. 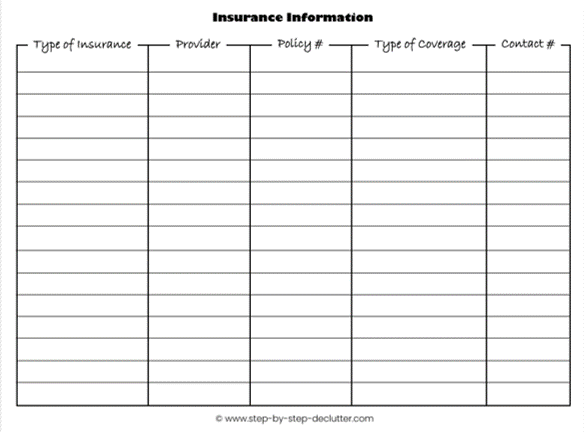 Include auto insurance, home owners’ or renters’ insurance, health insurance, and life insurance information. Business cards or contact information for medical providers seen by any member of your family. Prescription drug information for each family member – include the name and age of the person taking the drug, the name of the drug, the dosage and instructions for administering the drug. You may also want to include a list of possible drug interactions and potential side effects. 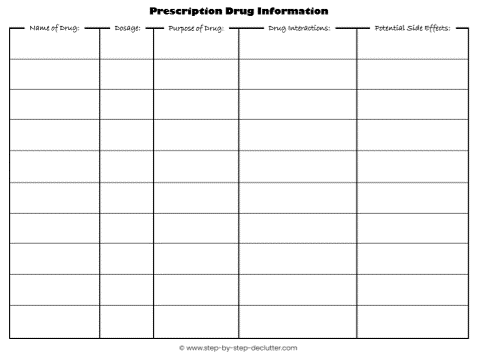 You can print your own version from the internet or simply include the drug facts information sheet provided by the pharmacist. 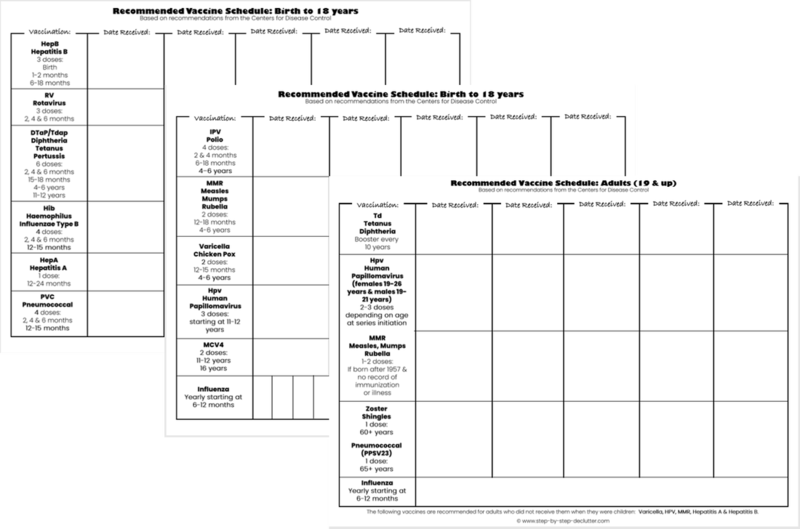 Click on any of the images below to gain access to my free printables library. In addition to contact information for emergency personnel, include a list of phone numbers for family, neighbors, and close friends – anyone you, your children, or your children’s caregiver might need to contact in an emergency. It may seem silly to write all these numbers down when you have them stored in your cell phone, but what if cell service is down, your phone is lost or stolen, or your phone’s battery needs charging and the power is out? It has become so convenient to store information in electronic devices that many people do not bother committing important numbers to memory. Ever had to look your own phone number up in your phone? It’s a good idea to have a backup. ​Include this information in the emergency section of your Family Facts binder. This will insure that anyone calling for emergency services from your home (including children and babysitters) can easily guide ambulance, police, fire fighters, or others to your door if need be. Make sure everyone in your home and anyone caring for your children knows where the Family Facts binder is located and what information it contains. Take it with you when you visit a new health care provider (or remove the relevant pages to take with you). Grab it in an emergency should you be forced to evacuate your home for any reason. A Family Facts binder is a great way to organize as well as declutter papers. These are just a few of the many ways to utilize binders to declutter papers. 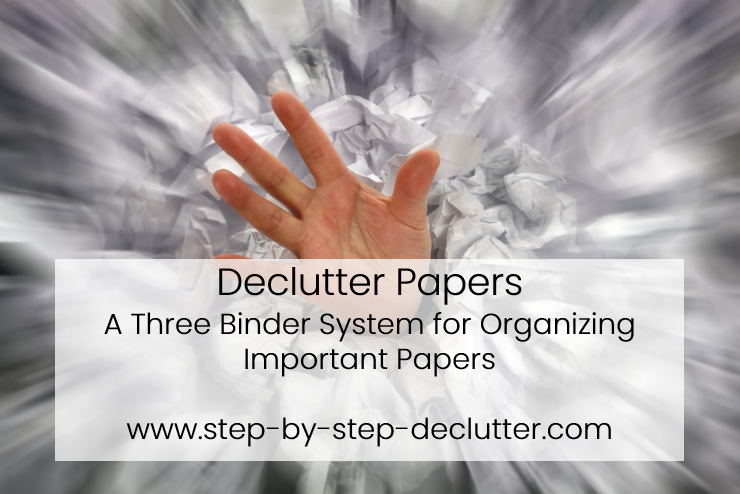 I encourage you to put this system to use in your home and organize all your paper clutter. Doing so will give you a wonderful sense of peace knowing that everything has a place and you can find important information when you need it. If you found this information helpful, please share it on social media and help others to experience the peace of mind that comes from conquering paper clutter. Please leave me a comment in the section below as well. I would love to hear from you!